We spent the last two weeks in Israel and visited a couple apple-growing regions (yes, you probably didn’t know Israel grew apples). 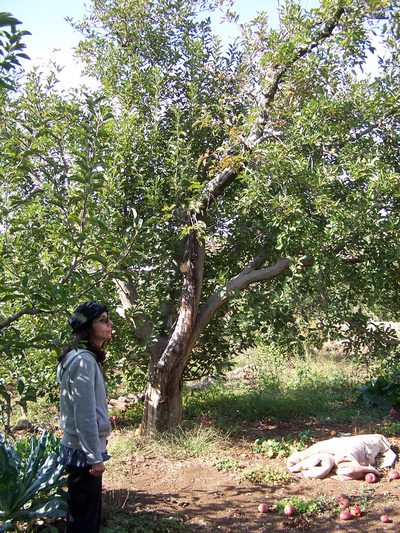 The above tree is in the Golan Heights in a Druse village and is one of the first apple trees planted there in 1946. The variety is Starking Red Delicious and it is considered old by their standards and middle-aged by ours. The northern portion of the Golan up against Mt. Hermon is quilted with apple orchards, mostly grown on local Hashabi rootstocks, trained as semi-dwarf spaced about 10 to 15 feet apart. The varieties growing in the area were Golden Delicioius, Starking Delicious (Red Delicious hybrid), Granny Smith, Smoothee (a Golden Delicious hybrid), Jonathan, and Gala. None of these would be much good flavor-wise in the store. However, a grower there said they had just harvested their first Pink Lady apples, which he said were delicious off the shelf and fetched an excellent price. You can expect to see more of them there in the future. I would love to get a hold of the Pink Lady orchards in Israel. Do you have their contact details by any chance? Sorry for the late reply; you’ll just have to look for them in the grocery store, as I do not know the name of the grower I spoke to through an interpreter. They’re probably propagating them as fast as they can, so it will be about three years before you see them on the shelf.